Fab moves an AKG C12 around until the drum set sounds good with just one microphone. The attached zip file contains the audio examples of every position in every acoustically modified environment. Please download the files and use it to form your taste, experiment and help you choose where you will set your microphone and your drum set in your room. Good morning children! Today we're going to talk about recording the drum set with a vintage vibe. they had 1 mic. 1 instrument, 1 microphone. 1 for the drums, 1 for the horn, 1 for the bass. which is very important, even if you're into, and if you have to, record the drums with multiple mics for sonic reasons. On drums we have Will Smith, who's standing in for Keenan, our regular drummer, who was held back on a shoot. Let's go! The first I do is that I ask the drummer what he's gonna play. Because that will change the focus of the set. If the song is just one big tom roll the whole time, which happens from time to time, maybe you want to focus on that. If the song is just a pocket, then you don't really need the ride. So it's a good idea to talk to your drummer, because drummers are people too. What are you gonna play? - I'll be playing the verses on the hat, and the chorus on the ride. - Great! So now we've got to focus on both! Life is beautiful! The other thing you might wanna do is actually have him play the pocket he's gonna do, so you have an idea of the balance of the set, to know if the set is tuned, and stuff like that, and also how the set sounds in the room. Now, here's what's important! I always tell the drummers I work with: Listen, do not blast me. because... check this out! If he plays the snare really loud right now, my ears are gonna get used to that tone and tone down, because it's really, really loud. Then I'm gonna go back to the Control Room, I'm gonna listen to the same thing, and it's gonna feel really dull and quiet, so what am I gonna do? Make it louder and brighter! And then tomorrow, when I open that session, I'm gonna hate myself in the morning. So the idea is to have a good line of communication and trust with your drummer that he's not gonna blast you while you set up your mic, so that when you go back to the Control Room, you're actually hearing the reality, not some dull version of it. It's really important. Some drummers don't know they're playing, because they're just nervous, and they keep playing, and they're practising, and that kind of really kill you. Before we place the microphone, I wanna hear the pocket. I'm gonna step back, so I don't get blasted. what I'm gonna hear when you play the song. So here we go. Obviously, we're going for a James Brown Clyde Stubblefield kind of vibe, where every instrument in the set is playing at the same time, so we need a balanced tone. Common sense goes a long way here. If you want a balanced tone of everything, you might want to put the microphone about the same distance from everything. Right? Here, I'm gonna use an old AKG C12, Austrian mic. the sound has the time to dissipate before it hits the capsule. There you go... Like that! So, I don't have any innate science to know that this is the perfect position. I know that that makes some sense, so it's probably a good idea to listen to it. Let's do that and make adjustments, based on our taste. Ok, so that's cool, I get a good balance of everything, but I don't like the sound of the snare. It's a little roomy, a little fuzzy. So I have two options there: I can get the microphone closer. If I do that, then the balance is gonna go away, probably the ride is gonna be too loud when he switches to it on the chorus. Maybe we could try and change the sound of the room by putting a gobo, to see if we can tighten the snare by having less reflections, if that makes sense to you. If we have a gobo here, the snare won't bounce back as far, it'll feel a little tighter. We should try that. The gobo helps the snare a little bit, but it's subtle, and the snare is still pingy. When I'm hearing it coming out of the speakers, which is what you're hearing, it does not really match what I'm hearing in the room. At least, it's not as good. We could tune the snare, we could move the mic, but my gut feeling is that the position of the whole set in the room is wrong and the snare is exciting the room in weird ways, and the mic is capturing that. So we should probably try and move the whole thing, set and mic, somewhere that would have less of that problem. And I would say my guess is closer to the back gobos would do that, because the reflections will be at least different, if not less prominent. So let's do that, let's just move everything back. So here we are moving the carpet back, it's a fun job. Little advice, if you have microphone stands on the carpet, although you really feel that you're not gonna break any, you probably will break some at one point, so don't do it. And now, I'm moving the microphone to the exact same position, in relationship to the drums, as it was in the previous take. See the difference that it makes. It's so much better, right? The ping on the snare is gone, the overall set is not as bright and aggressive, it sounds even more balanced, I really like this. I still have a problem with the amount of room and the distance of the snare. As a side note, it's always scary to listen to a roomier drum sound in solo. At this point, you probably would want to listen to the sound with the rest of the instruments if you can, because you may find that even though in solo, it seems far away, within the sauce of the whole track, it's actually kind of perfect. And that if you change your miking to be closer, you may have to do some tricks at mix time to be able to put some distance in the snare. In this case, I feel we should probably try and get a little more snare in the balance. And to do so, I'm gonna move the microphone. Common sense tells me that if I want more snare, it might be a good idea to move the mic towards the snare. Genius! Also, common sense tells me that if I have too much room, if I get closer to the instrument, I'll get less room. I have a PhD in common sense. Now, it's lower, it's closer to the snare. What do I have to watch out for? I have to watch out for the hi-hat. The hi-hats are notoriously incredibly loud. And a lot of drummers bash on the hi-hats. 60% hi-hat and 40% snare, which is not groovy. We also have to make sure we're not losing the ride on the chorus. I think this is pretty much what I was looking for... for this drum sound. Now, obviously, you're not gonna be able to do this entire set of things on every session. You have a bass player who's there, you have the guitar player, and the guitar player's girlfriend, there's a lot of people putting pressure on you to get the drum sound. But overtime, you'll know where drums sound good in your room, and you probably will go for that spot first. And then it may not be consistent, and you may fail, but that's ok, you can fix it in the mix, right? But otherwise, you'll have your favorite spots for the different kinds of musics, and the different kinds of sets, and of drummers, and you'll be able to narrow down the options. The scary thing is the number of options. The key is to narrow down your options overtime so you know you can expect, anticipate what things are gonna do, so you don't have to go through this mess every single time. Side note: since there's the vintage sound and there is the modern perception of what the vintage sound is, and they're never the same, in this particular case, for this particular groove, I would probably add a bass drum microphone to be able to have the Boom Boom that everybody expects. But I'm interested to see what it would sound like if it wasn't a 15,000 dollar microphone. Wouldn't that be interesting? Let's put some Shure SM81 venerable overhead microphone, roughly in the same spot as the C12 was a second ago. Pay attention to what it does to the presence of the snare, to the tone of the overall set, and to the presence of the bass drum. Ok? You've been listening to the C12 for a while, now this is a completely different mic, in the same position, with the same drummer and the same set, in the same room. Check it out! That's so much brighter, and not as balanced, we lost the bass drum, we kind of lost the tom too. It sounds fine, but it's not as... one-instrument-y as the C12 was. I do like the focus on the snare, that's a cool sound, I could use that for another purpose, but if I were to do this with this mic, I probably would keep moving the mic until I'm happy again. Let's go to the Control Room and listen to everything, and draw conclusions. Thank you Will! Let's go back and listen to the first position in the room, which was forward, and then the second position in the room which was back 2 feet, and compare the difference again, and focus on that. I'd like you to focus on the snare, so make a mental picture of the snare sound in the first pass, and try and apply that to the second pass. Ok, big difference, right? The snare is not as pingy, and it's fatter on the second pass. Now, I'll play it again. Focus on the bass drum. it's boomier, it goes Boom! Boom! On the second pass, it's "Pock-ier", it's got more density. For my personal taste, and what I'm doing right now, I like the second pass better, further back, because it's more contained, I've got less reflection, I've got less buoyancy, and it's more controlled. I like that. Now, don't forget that between the first position, and the first position with the gobo, there's a huge difference too. I'll play the first one again. So that's a huge difference. The kick and the snare are very affected, just by putting that one gobo there in a wide open room. So next time you've been tuning your snare for 30 minutes, and it still doesn't sound good, you might wanna try moving the whole set 2 feet that way, or that way, and that may solve your problem. Room acoustics are really important. When there's a problem like this, most people tend to switch the mic, or switch the preamp, or switch the converter. switching the place of the instrument inside the room is crucial. Now let's go to the last example, the one in the back of the room, with the microphone over the snare, and listen to it once. I like the balance of this. I like how it's capturing the instrument as one, as opposed to capturing a bass drum and a snare and a hi-hat. That's not a sound we're gonna hear on a record very often, even old records, because there would have been some processing, maybe a limiter behind the console, maybe some tape, maybe, you know, a lathe limiter, I don't know. So let's put some processing on this, to get the vibe of what this 1-mic technique would sound like on a record. I'm gonna use this Fairchild plug-in made by UA, which is pretty wonderful. I'm gonna lower the output a little bit, so that the processed and unprocessed signals are at the same level, so we don't get fooled by volume. I'm gonna play two bars with, and two bars without. Here we go! Now that's a sound we recognize. I like the fact that the snare is tucked in, and I like the fact that it's even more together, even more one instrument. I like the fact that it feels more like a sauce dish than individual ingredients in one pot. As a side note, if you remember, we switched to the Shure SM81 at the end. I'm gonna play the C12 one last time with the processing on, and then I'll play the SM81 right next to it, so you can get the vibe for the difference. A gentle reminder that there are things we cannot fix in the mix. Now, is this the right tone for you? If you're doing the new Usher record, probably not, unless Usher found a brand new retro vibe. But it is really important to know that this is the way that people have been recording drums for many, many years on classic records, and that the new techniques really evolved out of this technique. 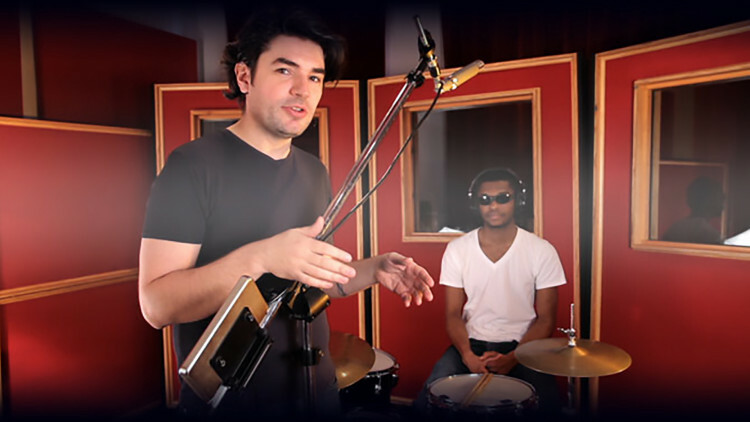 So room acoustics, instrument placement inside the room, microphone choice for tone, microphone placement for balance, interacting with the room acoustics and the instrument placement in the room, are the things that you probably need to master to be able to go from 1 microphone recording drums to 26 microphone recording drums. Thanks brother, can i borrow your drummer? Great video, nothing but useful information on puremix! How long did it take you to learn all these concepts and philosophies. Where did you find all this information that you share with us, i wish i would've had the chance to shadow you since the first day you made a record, maybe that way i could be half the engineer that you're now. Thanks for everything, bless. Thanks for some great knowledge! I really appreciate the fact that the same demonstration is done with both a mic that we all want, and then a mic that we all have! There are so many online videos / tutorials that show great gear that only pro studios have. @BobRogers: This is true. Don't worry though, these 2 techniques you are referring to are the subject of other videos that are currently in the pipe line. Glad you enjoyed it. Very good job. One thing you didn't mention is that this is the first step in two or three mic techniques like Recorderman and Glyn Johns. Both of those methods depend on the first mic being well positioned. This is an excellent tutorial and video! Learned so much about using 1 mic. Not too many people consider the positioning of the drums in the room. Very nice!